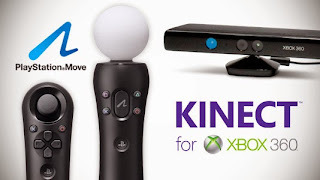 It's All My Blog: Playstation Move catching up with Xbox Kinect? Although Kinect got off to a great start, it's a worrying sign that 8 of the 10 million sold were in its first 60 days of release. The Christmas period is drawing closer, and both developers and store managers have begun talking. Speaking to IndustryGamers, Ubisoft's VP of Marketing Tony Key said: "It's not healthy to just sell in the holiday, or 90% of your units in the holidays. We would really like to see them have some major launches during the non-holiday part of the year." With talks of a new Xbox on the horizon, are Microsoft's plans to treat Kinect as a console launch getting scrapped? It's unlikely, with nearly 50 games in the pipeline and a large advertising campaign backing it. Playstation Move has a far less impressive schedule, following a decent launch that may peter out after the faithful have grown tired of it. It's hard to say who will win the motion wars, but as the Wii U draws ever closer, these are exciting times for gaming.